NoiseBuster, The Sound of Silence ! Ik lees liever de Nederlandse versie ! You're on a plane, but shudder realizing you have to hear those engines for another 8 hours. You need to work on a project but noisy traffic is at an all-time high. You must write a report on a hot day but the airco- noise keeps drawing your attention. The humming of large crowds of people seriously distracts you while working. You want to meditate but the world around you won't come to rest. If you suffer from this kind of low-frequency noise, try the NoiseBuster from DateLine Direct ! DateLine Direct is the exclusive Dutch distributor of the revolutionary NoiseBuster with Anti-Sound. 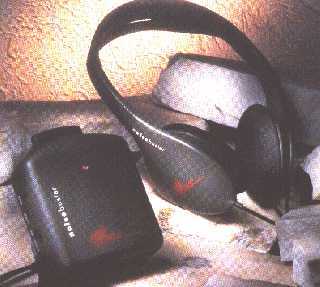 The NoiseBuster is a stereo headphone with built-in microphones. These microphones listen at the sounds that arrive at the outside of your ears. The signals from the microphones are being analyzed by electronics inside an 8x8x3 cm sized box. The electronics reverse the signals and send it back to the quality speakers inside the headphones. This technology effectively 'wipes out' virtually all of the low frequency noise before it reaches the inside of your ears ! This is called Active Noise Reduction. The NoiseBuster is also available in shops, see below for a listing. THE NOISEBUSTERS ARE SOLD OUT ! and will not be available soon.